Ernest Mandel (1989): "How To Make No Sense of Marx"
Originally published in Analyzing Marxism. 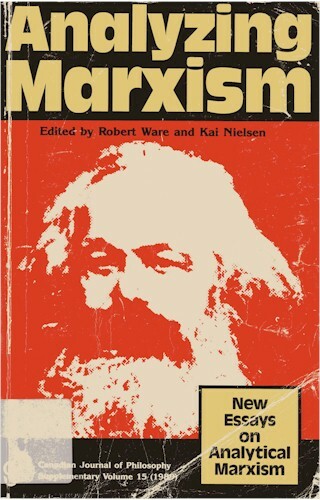 New essays on Analytical Marxism, Edited by Robert Ware & Kai Nielsen, Canadian Journal of Philosophy, Supplementary Volume 15, 1989, The University of Calgary Press, pp. 105-132. Social science explanations are seen as three-tiered. First, there is a causal explanation of mental states, such as desires and beliefs... Next, there is intentional explanation of individual action in terms of the underlying beliefs and desires... Finally, there is causal explanation of aggregated phenomena in terms of the individual actions that go into them. The last form is the specifically Marxist contribution to the methodology of the social sciences. ...the doctrine that all social phenomena - their structure and their change - are in principle explicable in ways that only [!] involve individuals - their properties, their goals, their beliefs and their actions. It is true that a paradox should not be rejected out of hand. Like all hypothetical statements, a paradox should be checked against the facts. Unfortunately for Elster, his paradoxical assumption cannot stand that test; i.e., it does not correspond to Marx's thought as distilled from an objective overall study of his writings, and is unable to explain the real march of history. This is not to say that the problem of correlating individual and social groups' actions, and therefore also individual and social groups' interests, goals and beliefs is not a very real one. I have dealt extensively with one aspect of that question elsewhere. But the very way in which the problem is formulated implies that what must be correlated are two different sets of phenomena, even though they often appear to be combined. Psychology and sociology are not identical sciences, not even asymptotically. They handle different empirical data. They deal with different materials of human life, experience and development. This is what Elster implicitly denies; that is where he is fundamentally wrong. That specific societies (either modes of production or social formations) have a development determined by laws of their own, no Marxist will deny. I accept the accusation wholeheartedly. I even consider it one of the main superiorities of the Marxist method that it has been able to formulate these laws for different societies — and even for history as a whole. But that does not imply that individual actions 'derive' from the aggregate pattern. Only a fool would derive Einstein's discovery of the law of relativity or Hitler's pathological hatred of Jews from the class relations between wage-labour and capital. What is at stake is whether specific social conditions and institutions weigh decisively on shaping certain concrete forms of individual actions — more so than individual desires, passions, beliefs, goals, etc. The way in which Hitler became chancellor of the Reich or in which he could unleash the Second World War cannot be explained essentially, primarily, or in any important way through the secrets of his individual psychology; nor can Einstein's genius explain why and how the USA dropped the atom bomb at the end of World War II. That is what the debate between 'methodological individualism' and 'methodological collectivism' (whatever the value of these formulas, which is very dubious as far as I am concerned) is all about. In both instances — as well as in all others relevant to the history of class societies — the weight of social forces, of classes, main class fractions, governments led by such fractions, was much more decisive than that of any individual or any unstructured aggregate of individuals. Nor is it a question of 'priority' in the explanatory order, either from a chronological point of view or from the way analysis begins. It is a question whether an individual's actions and beliefs are not bent, changed, transformed through social pressures over which he has no control, and of which he often is not consciously aware. Take the basic problem of human life: sheer physical survival. Without food, shelter, and a few other basic necessities, no human individual can survive. Contrary to other animal species, humankind cannot get such necessities through purely individual nor through purely instinctive endeavours. It can only get them through human social labour, i.e. in conjunction with other individuals, on the basis of common, conscious goals. The desire to get food is universal for all human individuals. But the concrete way in which this desire can be fulfilled is less dependent upon the individual peculiarities of each person, his psychological 'uniqueness' (which is very real), than on the social conditions in which he is embedded: relations of production and of communication, levels of development of productive forces, etc. In a slave society, a slave can only get food by submitting to his master's will. In a feudal society, the average serf can produce his own food, provided he respects a certain number of rules imposed on him by the lords: e.g., that he works for nothing during three days a week on a demesne or monastery. In contemporary bourgeois society, if he is not a subsistence farmer (these farmers do not represent more than one to two percent of the active population in imperialist countries), the average producer can only get food in exchange for money, and he cannot get enough money to buy the basic necessities of life without selling his labour power. All these are compelling social circumstances, largely independent of the individual's will, and not of his own choice or creation. So it simply is not true that all social phenomena are explicable in ways that, in the final analysis, only involve individuals. Their explanation must also involve social forces and institutions which have a logic of their own, separate and apart from that of any individuals who compose them - irrespective of whether that logic operates a priori or a posteriori to that of personal motivations. After World War II, surviving SS-men and -women generally remained as authority-directed, 'law-abiding,' servilely obeying commands transmitted through hierarchical authority - i.e., totally myopic ideologically and morally - as they had been in 1930, 1935, 1940 or 1942-‘44. At the same time, they deeply loved their children, put flowers on their parents' graves and tenderly caressed their pets, exactly as they had done when they were busy killing millions of people. Yesterday they committed horrible crimes; today they don't. Essentially, they hadn't changed as individuals; the social environment had. One hundred thousand individual SS, taken separately, are not a criminal association. One hundred thousand SS organized, commanded and spurred on by Hitler, Himmler, Heydrich and their main henchmen, with their actions tolerated by the state and the ruling class under given specific circumstances and for given specific social reasons, are indeed an association of criminals. The potential to become criminals must be present inside these individuals, but that potential is only realized under given social conditions. Elster is right on one important point. There is no such thing — and certainly not in Marx's doctrine — as 'capital' or 'history' endowed with a logic of its own, separate and apart from the sum-total of human beings which are concerned with them. Indeed, one of the basic discoveries of Marx is precisely that 'capital' is, in the final analysis, not a bunch of things (not even a mass of money) but a specific relation between individual human beings. But these are precisely, always, individuals living under specific social conditions, i.e., concrete social individuals. Individuals 'in general', divorced from the social conditions in which they are embedded, are as unreal, abstract and metaphysical (mythical, pure products of imagination) as 'history' is in general and in the abstract. A worker is exploited if he would be better off were he to withdraw with his per capita [!] share of the means of production. This argumentation, which seems — and only seems to do so quite superficially — to make sense for the individual worker, becomes blatant nonsense when applied to the mass of the wage and salary workers as a whole. Could 25 million wage and salary earners in Britain, France, Italy, West Germany (not to speak of 110 million of them in the USA) 'withdraw' with their 'per capita' share of the means of production, their income being what it is and the cost of machinery or the price of land being what it is? Could they conserve 'their own means of production', the weight of concentrated banking and industrial capital being what it is in the economy? Could they en masse survive crises, unemployment, sickness, and old age, the income and hazards of petty shopkeepers, farmers, industrialists, handicraftsmen being what they are in real society? Doesn't the absurd Roemer-Elster hypothesis lose its obvious unreality only if and when one simultaneously assumes a radical change of all concomitant property and power relations in society (i.e., an overthrow of capitalism)? Individual workers can opt out and do indeed opt out of the proletarian condition. They not only become shopkeepers and handicraftsmen; they also become hippies or clochards; or they try to live as subsistence farmers, or on wild berries in the woods. But as statistics show over more than a century, this is a small (and declining) minority. A growing majority (more than 90 % of the active population in several countries) ends up selling its labour-power to the owners of capital or to the state. Why? Because they like to or prefer to? No. Because they globally, in their majority, have no choice. There just aren't enough wild berries around for 50 million proletarian families to live on in the USA. One could try to retort that prevailing social conditions — for simplicity's sake, we shall reduce them to prevailing social relations of production and communication — could only prevail because they conform to 'prior' individual motives and choices. Commodity production becomes generalized because it corresponds to the individuals' preferences for 'property' and 'freedom' based upon property. But this is again historically untrue. Generalized commodity production and market (money) economy were imposed through institutional changes and specific economic processes (like enclosures) upon tens of millions of human beings on all continents, against their clearly expressed wishes and their furious successive revolts. Furthermore, the theory confuses cause and consequence. In the long run, part of the 'mentalities' (mental structures) conducive to a more or less smooth, continuous reproduction of a given set of relations of production will indeed become interiorized in the majority of the toilers (never permanently and never for all of them). But this is a posteriori and not a priori, nor even simultaneous to the emergence of these relations of production. One has merely to study the interminable diatribes of bourgeois economists, politicians, 'moralists, 'preachers, 'discoverers, 'ethnologues, etc., from the fifteenth to the twentieth century, against the 'lazy' Flemings, the 'lazy' English, the 'lazy’ Irish, the 'lazy' French, the 'lazy' (unbelievable but true!) Germans, the 'lazy' Italians, the 'lazy' Spanish, the 'lazy' Hungarians, the 'lazy' Poles, the 'lazy' Negroes, the 'lazy' Mexicans, the 'lazy' Indians, the 'lazy' Hindus and so on ad nauseam, to understand ths time-lag. The universal work-ethos does not precede the birth of the capitalist industry. It is its most characteristic illegitimate offspring in the field of mentalities. Another clear example of the misguided nature of Elster's assumption that social phenomena are but 'aggregates' of individual actions inspired by individual desires and passions, is offered by that most negative of all social phenomena: war. The instinct of self-preservation is the most basic human drive, prevalent even in the basic drive to get food and shelter. Yet in spite of this instinct, human beings periodically engage in wars in which millions upon millions have been killed throughout the ages. Why this folly? Because individual 'beliefs' and 'desires' more essential than the wish to conserve life have suddenly sprung up again and again among them? While not denying that there exist fanatics who are indeed willing to sacrifice their lives for a given cause, I think it stands to reason that the overwhelming majority of soldiers who have composed and still compose the armies of yesterday and of today cannot readily be classified into that category. They are (with great and generally growing reluctance) submitting to the risk of dying under compelling social circumstances: because military discipline is imposed upon them; because the alternative is being shot immediately (which seems a greater immediate risk); because they do not see any way out, given the fact that an individual revolt against the war is largely meaningless; because ideologies which present wars as 'good' or 'lesser evils' still influence the minds of some of the people; etc. Indeed, when these conditions change — as they sometimes do — collective revolts against war do occur, even in large armies. Again, one could object: aren't wars possible only as a result of the individual's 'aggressive drives' and 'death wish,' which, after all, according to Freud and other psychologists, precisely coexist with the instinct of self-preservation and the 'pleasure' principle (Lustgefühl)? This is a sophist's argument. If the origins of wars can be reduced to the individual's 'death wish', why aren't wars permanent, since this 'death wish,' together with the 'aggressive drive', is supposed to be permanently omnipresent? Why are there historical periods and, indeed, historical social organizations (frameworks/ relations of production) that are much more peaceful than others? If this is in fact the case - and it is hard to deny it in the light of historical evidence - is that not a clear example of a social phenomenon (war) not resulting from a simple aggregate of 'individual drives/ passions/ desires/ beliefs/goals/' but resulting from these 'drives' mediated through social institutions and social forces, their correlation of forces, their conflicts and clashes, etc.? Under the pressure of these circumstances - above all, price competition on the market - the individual capitalist is forced to regard wages of his workers in the first place as costs to be cut, regardless of his supplementary 'thoughts', 'assumptions' and 'motivations' in relation to 'aggregate demand,' public sanitation, survival of the fittest, or the best way to save his own and his workers' immortal souls. (These are all very real, but cannot, at that stage, determine his attitude towards his workers' wages, except in the marginal case when they make him indifferent to going bankrupt; i.e., they are not representative of capitalist entrepreneurs as capitalist entrepreneurs.) And as, under these conditions of near-free competition and still slow technological innovation, he will indeed be able to hold his share of the market only if he cuts costs, there is nothing 'logically contradictory' at the micro-economic level in such an attitude among all entrepreneurs. But are these attitudes self-contradictory on a macro-economic level? Of course they are. And these contradictions express themselves concretely through economic crises of overproduction, obstacles to technological innovation resulting from low wages, a search for more and more distant markets (with increased transportation and circulation costs) when markets nearby still remain undeveloped, the need to face workers' strikes and revolts which are increasingly costly, the personal hazards for the capitalists of epidemics resulting from widespread misery in workers' quarters in large cities, etc. So the capitalists begin to diversify their attitude towards wages, not because they bow before 'logic,' but because they bow before changing social priorities born of changed social pressures. (It should be noted in passing that small capitalists, in deadly fear of losing their market shares and their shirts, will 'give in' to that pressure with much greater hesitation than do big ones. Indeed, a more 'flexible' and 'progressive' attitude towards workers' wages becomes an additional motor for the concentration and centralization of capital!) So the big capitalists will periodically - especially in periods of prosperity - look not only upon the wages of other capitalists' workers as potential purchasing power for their own goods, but also consider their own workers' wages as such. Henry Ford was the embodiment of that 'turn.' Keynesianism became the creed in the field of bourgeois economics which expressed this new pressure. But that 'solution' of Elster's 'antinomy' is always temporary and limited. At the very time he was composing his book, the international bourgeoisie made a turn in the opposite direction on a worldwide scale. In the midst of recurrent recessions and a 'long depressive wave,' with US industrial production capacity only utilized at an average of 70 % (and for civilian purposes, i.e., leaving out parasitical military production, probably less than 60 %), capital is busy cutting the wages of its workers in all advanced countries and even more so in most underdeveloped ones. Has it suddenly gone mad? Has it forgotten Elster's 'logical antinomy' and 'contradictory assumptions'? Or is it just bowing to the overwhelming social priority of increasing the rate of profit? Elster attributes to Marx the absurd idea that wages hover around the physiological minimum under capitalism, and then goes on to debunk that idea, among other things, with the concept that individual workers have different individual needs (11-12). One of Marx's main scientific innovations was, however, precisely his resolute rejection of the Ricardo-Malthus-Lassalle 'iron law of wages' (or 'wage-fund' theory). For Marx, the only 'fund' existing was the totality of newly created value (added value, net national product, national income), the precise division of which between capital and labour was a matter of concrete struggle, indeed the first and foremost object of the current class struggle. That is why Marx substituted for the demographical wage theory (which sees wages hovering around the physiological minimum), an accumulation-of-capital-wage-theory which (by taking into account not only conjunctural, but secular, movements of supply and demand of labour power) distinguishes two components of wages: the physiological minimum and the moral-historical component. This last is dependent on the vicissitudes of the class struggle, and is related to, but not mechanically determined by, the medium and longterm fluctuations of the industrial reserve army of labour. Everything is wrong here. In the first place, for Marx, labour is not a numéraire, a simple measuring stick for the different 'factors of production.' It is the substance, the essence of value. For him, value is nothing but a fragment of the total abstract labour potential available in a given society at a given time ('abstract' meaning an abstraction made of the concrete use-values that labour produces, i.e., of a distinction between different trades and occupations). It is, therefore, different from wages, which are just the values (better: market prices oscillating around values) of one particular commodity: the commodity labour power. The disconnection of value from wages in a much more systematic and total way than Ricardo's theory was what Marx considered one of his main theoretical achievements (not a step backward). Third, like all value, the value of labour power is a social, and not an individual, phenomenon. It is determined by the average productivity of labour in the consumer goods industries (length of labourtime put into the production of these goods), independently of the way in which each working class family divides up its income between different wage goods and services. This could only be challenged if luxury goods would seriously influence the workers' standard of living. But such an assumption is both logically and historically inconsistent. When luxury goods no longer are consumed only marginally by workers but become widespread in workers' families, they stop being luxury goods and become wage goods. And then the struggle unfolds to have the money wages include the capacity to purchase what were formerly luxury goods in addition to previous wage goods. When and if this struggle is successfull the value of the new wage good widely consumed by workers' families is included in the value of labour power. Fourth, and this is the key question: all these processes are social processes not only in the sense of social averages but in the sense that they result from struggles between living social forces, leading to a new 'social contract,' i.e., newly recognized average wage(s) for the society in different branches of industry (or even on a national scale), or a new quantity of 'socially necessary labour,' necessary to reproduce the commodity labour power. Today, in many countries, this occurs in a conscious or semi-conscious way through industry-wide or nation-wide collective bargaining (tomorrow it will start occurring internationally too). The value (costs of reproduction) of labour power does not change if one worker (or even one hundred thousand workers, except in a very small country) radically changes the product mix of his consumption packet, becomes a food faddist or a vegetarian, a smoker or a non-smoker, a tee-totaller or an alcoholic. It does change when, as a result of a successful struggle by the labour movement, the workers succeed in incorporating, for example, paid holidays or free health services or motorcars, in the annual average wage. It changes again - now in the opposite direction - when the employers (with or without the help of the state) succeed in imposing increased individual payment for health services or pensions or education upon the working class or, through a lowering of real wages, eliminate the possibility of worker's families buying certain customary goods and services with their direct money wages. So, Marx does not assume and does not need to assume that every individual worker's family consumes the same bundle of wage goods and services, either to 'defend the assumption of a given value of labour power' or to 'prove' his particular version of the labour theory of value. One of the most important aspects of Elster's book is its harsh rejection of the dialectic (34-48), presented nearly exclusively as 'Hegelian metaphysics,' i.e., as logical antinomies. Elster refuses to consider Marx's version of the materialist dialectic as grasping real contradictions (i.e. the contradictory character of the movement of nature, of history and of the cognition process itself, the subject/object relation). But this rejection of the materialist dialectic has a boomerang effect upon Elster himself. He rejects dialectics, but he is caught by dialectics like a fly in a spider's web. Independently of his will, his thought becomes increasingly incapacitated in trying to grasp real historical processes, precisely because those processes appear at first sight 'logically inconsistent.' The alternative answer - that his particular 'logic' is at fault, because it is mechanical and formalistic, instead of being dialectical - does not seem to occur to him. When he deals with the problem of the so-called primitive (original) accumulation of captal, he follows Max Weber, severely taking Marx to task for presumably not seeing the difficulty of understanding the 'reinvestment motive' at the dawn of bourgeois society (39). But the problem is not finding a 'motive' for money-capital, owners to reinvest profits. Merchants and money-changers (bankers) have been doing that for thousands of years in the most different of civilizations. Innumerable treatises have been written on the way to divide and reinvest profits, from the Talmud to learned contributions by Roman senators, Chinese sages and Muslim philosophers. Indeed, Marx was quite right when he pointed out that it is the very nature of money-capital to be constantly bent upon money accretion. To throw money into circulation instead of simple commodities (M-C-M' instead of C1-M-C2) literally does not make sense if money thereby does not grow in value. And it cannot grow in value without at least partial reinvestment of profits (i.e. accumulation of capital). Only when the relationship of socio-political forces changed, when real and durable guarantees against expropriation were achieved, did discontinuous reinvestment (accumulation of capital) become continuous and could the capitalist mode of production definitively emerge. In the fifteenth century, banker Jacques Coeur could still be expropriated by an ungrateful King Louis XI, whose wars for the unification of France he had financed. In the sixteenth century, Emperor Charles V of Spain, Austria and the Low Countries, not to mention the Americas, could no longer expropriate the Antwerp and German bankers who financed his wars. Relations of social and political forces had changed, not the 'motives' of money-capital owners. An increase in the productibity of labour only leads to the possibility of a surplus emerging and to the possibility of exploitation, Elster argues on p. 169. Whether that possibility is realized or not depends upon the producers' 'readiness' (willingness) to work more; they could always work less. But that is not the real chain of events in the emergence of class society. Increased productivity of labour eventually led to a real surplus (e.g. granaries), which then became appropriated by foreign conquerors (Greece, pre-Columbian American civilizations, tropical Africa) or interior rulers (Egypt, China, Rome, etc.). When Elster argues that the producers could 'refuse' to work more in order to produce the surplus, he forgets that they were forced to do so by their rulers. That is precisely what class rule is all about, in the final analysis. The only alternatives were to revolt or to run away. That they often did. Class rule plus surplus production could be consolidated only inasmuch as these reactions became only minor, marginal and periodic ones. If a serf works three days a week on his own manse and three days a week on the lord's demesne, the 'ultimate origin of the lord's income' is quite clear: unpaid labour by the serfs. Likewise, when a worker adds value to that of machinery and raw material by applying his muscles, nerves and brains to them during a work day, the fact that he reproduces the equivalent of his wages (or the value of his labour power) in, say, four hours a day while actually working eight hours, means that he gives his employer half of his work week for nothing, exactly as the serf discussed above did. There you have 'the ultimate source of profits' (better: of rents, interests and profit, i.e. the whole bourgeois class's income). In the case of a slave or a serf, the process is crystal clear. The fact that in the case of a wage-earning industrial worker it is obscured by all kinds of successively intertwined money transactions and market relations makes its discovery more difficult. But it doesn't make the process less real. It was Marx's greatest contribution to economic science (and to history!) to explain that process through his theory of surplus-value, which in the final analysis is nothing but the monetary expression of the surplus-product of society. In order to deny the substance of that theory, one would either have to deny that the workers do add value to that of machinery and raw material, or that the value they add is divided between capital and labour (i.e. assume that all value they add is appropriated by themselves; but in that case, why would the capitalists be interested in hiring them?). This has never been successfully demonstrated. So Marx's theory of surplus-value is alive and kicking today, just as it was 130 years ago when it was first formulated. The fact that the surplus product (surplus value) produced by the working class could be used for different purposes is totally irrelevant to the two key questions: Who actually produces it? And who actually appropriates it? Nobody will argue seriously that the serfs don't produce the lord's income just because the lord uses part of it to build a chapel or a road. The view that it is produced ex nihilo is a perfect example of a red herring; the implied conclusion that because of that red herring there is no proof of an 'ultimate source of profits' is a near-perfect non sequitur. Dialectical determinism as opposed to mechanical, or formal-logical determinism, is also parametric determinism; it permits the adherent of historical materialism to understand the real place of human action in the way the historical process unfolds and the way the outcome of social crises is decided. Men and women indeed make their own history. The outcome of their actions is not mechanically predetermined. Most, if not all, historical crises have several possible outcomes, not innumerable fortuitous or arbitrary ones; that is why we use the expression 'parametric determinism’ indicating several possibilities within a given set of parameters. Socialism is never seen as 'inevitable' by Marx. A deep historical crisis of a given society can end either in the victory of the revolutionary class or in a common decline of all social classes (e.g., a relapse into barbarism). That is what happened in antiquity. That is what could happen again today. If not, the conscious struggle for socialism would be largely useless, a waste of time, or only a hazardous effort to 'speed up' a process which would unfold anyway. Marxism rejects such a fatalistic view of history, a view to which Elster and the Kautskyan Second International are much nearer. Marxism also has a true perception of the ambivalence of social/political inaction and action. It is likewise not blind regarding the moral implications of inaction, which always imply toleration of the given and seemingly 'irreversible' course of events. It pleads the case of resistance, attempts to reverse the seemingly unavoidable, as long as the material/social parameters of that possible resistance are perceived. Neither Hitler nor Stalin was an inevitable product of historical developments. Nor were their victories inevitable. They came as the end result of chains of actions and reactions, in which the absence of action by certain social forces played key roles. The historical responsibility of German social democracy's inaction between summer 1932 and spring 1933 in Hitler's seizing and consolidating power - besides the key responsibility of the German ruling class and the subsidiary responsibility of Stalin's criminal political course - is overwhelming, and generally recognized by all serious historians. But no less great (although much less acknowledged by historians) is another responsibility, so strongly stressed by Rosa Luxemburg: that of leaving the victorious Russian revolution deliberately isolated and torn by war between December 1917 and autumn 1918. The Russian Thermidor, Stalin's dictatorshp (i.e., the political counter-revolution after the victorious social revolution in Russia), is a thousand times more the product of German social-democracy's counter-revolution in 1918-1919 (i.e., of Ebert, Noske and Scheidemann), than it was of Lenin, not to say of Marx. In the same way that a rejection of the materialist dialectic impedes an understanding of the mediating role of social forces between individuals and the social environment they are embedded in (and of the mediating role of the class struggle between relations of production and productive forces), it also prevents a correct perception of Marx's approach to human (historical) progress. This is not seen by Marx as simply linear, but always as self-contradictory. Each successive step towards humanity's mastery over nature is accompanied by a successive form of subordination of human beings to seemingly blind fate. It is also seen not as synchronic, but rather as diachronic. What appears as progressive in the short run could be retrogressive in the long run; the reverse is also possible. Everything is always a matter of a concrete analysis of a concrete process, not of metaphysical or logical generalities and abstractions. When Elster recalls Marx's stress on the progressive consequences of the British raj in India (111-12), he actually implies that Marx thereby justified the establishment as well as all the consequences of that rule! But why did the same Marx enthusiastically support the sepoy's uprising against that same rule? Elster might as well have pointed out that Marx and Engels likewise stressed the progressive character and consequences of slavery compared with certain preceding conditions, but simultaneously were full of admiration and support for the slaves' uprisings against slavery, beginning with those led by Spartacus. Is such an attitude contradictory and illogical? Not if one accepts the dialectical (i.e. diachronical) character of human progress. But that does not in the least imply that slaves and serfs should have resigned themselves to their 'progressive' fate. On the contrary: by revolting against slavery and serfdom, they in turn advanced human progress in a double sense. They forced the rulers to look for more sophisticated forms of exploitation, including technological progress (which came about partly as a result of a scarcity of manpower, i.e., a scarcity of slaves). They also established a conscious (ideological and political) tradition of uncompromising struggle against all forms of oppression and exploitation, without which the drive of the modern proletariat for a classless society would be incomparably more difficult. If one makes only a superficial perusal of Marx's and Engels' writings on the catastrophic social consequences of capitalist industrialization, one can only call that inference a crass misrepresentation, if not an open contradiction of Marx's thought. (It is true also that in other parts of this book, Elster contradicts himself on this subject.) The source of this misrepresentation is not dishonesty on the part of Elster, but ideological prejudice and pseudo-logical dogmatism (i.e. the incapacity to see the actual, real coherence of seemingly contradictory statements). Capitalist production, therefore, only develops the techniques and the degree of combination of social process of production by simultaneously undermining the original sources of all wealth - the soil and the worker. In the Afterword to the second German edition of Kapital... I speak of a "great Russian scholar"... [who] has dealt with the question whether, as her liberal economists maintain, Russia must begin by destroying the village commune in order to pass to the capitalist regime, or whether, on the contrary, she can without experiencing the tortures of the regime appropriate all its fruits by developing the historical conditions specifically her own. Inasmuch as we have both consciously, each in his own way, out of the purest of motives and with an utter disregard for private interests, been flourishing the banner for "la classe la plus laborieuse et la plus miserable" high above the heads of the philistines for years now, I should regard it as a contemptible offense against history, were we to fall out over trifles, all of them attributable to misunderstandings. Well, why didn't I answer you? Because I was constantly hovering at the edge of the grave. Hence I had to make use of every moment when I was able to work to complete my book to which I have sacrificed health, happiness, and family. I trust that I need not add anything to this explanation. I laugh at the so-called "practical" men with their wisdom. If one chose to be an ox, one could of course turn one's back on the suffering of mankind and look after one's own skin. And the man who wrote this flaming indictment of capitalism, based on tremendous moral indignation, is accused of regarding pre-communist individuals - including capitalist workers! - as 'so many sheep for the slaughter'! How can Elster be so blinded by his rejection of the dialectic as not to notice what a deep injustice he commits against Marx by attributing to him absurd short-sighted mechanistic notions of 'progress' and 'realpolitik' (as industrialization necessarily prepares society for communism, industrialization is unilaterally good, regardless of the price humankind and the workers pay for it)? In the eyes of Marx what is always decisive is the need to develop self-confidence, the abandonment of servility and resignation, the spirit of rebellion and contestation, the freely developed cohesion and unity of all the oppressed and exploited, precisely because, in the long run, all circumstances in which human beings are oppressed have to be overthrown, and that can only be done by the oppressed themselves. That is the 'categorical imperative' which guided Marx's politics all his life, and which often appears 'ultraleft' to Elster. But the contradiction is Elster's, not Marx's! For the alternative is arrogant, paternalistic elitism, in which 'scientists' (or 'scientific politicians') take it upon themselves to determine in a sovereign way, including against those involved, what is 'possible' and what is 'impossible.' The parallel with the Jesuits and the Stalinists is obvious, once that imperative and its necessary concomitant imperative — the 'emancipation of the toilers can only be the work of the toilers themselves' — is even partially and momentarily abandoned. It is my contention that, to his great honour, Marx never abandoned these two imperatives in his political action throughout his life. Nor should anybody claiming to be socialist. This is logically inconsistent and historically indefensible. The real logic should be reversed: communism is possible only when the development of capitalism creates a motivation for people to abolish it (subjective conditions) and when the material possibility for abolishing private property, commodity production and monetary rewards as the main 'incentive for work' (i.e. class society and the state) has been created. Why the possibility of communism should be linked to 'optimal conditions' for the development of the productive forces is a mystery, even more so when the 'optimum' is practically reduced to 'unbound technical progress' or even to the maximum of production (290-1). This is clearly a petitio principii. It is capitalism, not communism, which implies 'production for production's sake.' Why should the realization of all men's and women's personalities unavoidably be linked to an ever greater accumulation of (less and less useful) material objects? Why could the 'motive' for abolishing capitalism not be, for example, the need to save mankind from nuclear destruction; from the destruction of the natural environment; or simply from the health-destroying stress for all that is produced by the competitive rat-race, once all fundamental human needs could be satisified in spite of the abolition of private property? Why should their relative validity depend exclusively upon what system could produce more? Again, the approach is wrong: it misses one of the central theses of historical materialism. When a given society (with a given mode of production) is in structural crisis (i.e., it has entered its period of decline), when a given set of relations of production has become a fetter on the further development of productive forces, there occurs a rebellion of these productive forces against the social order, which takes above all the form of a rebellion of the human productive forces. In other words: pre-revolutionary and revolutionary crises occur, inevitably, independently of a foreseen 'ideal' outcome, or whatever outcome politicians, scientists, philosophers, moralists, or preachers think likely, independently of whether one believes that only bad changes can come out of them. Hardly had the ink dried on The Economist's pages, when the Old Mole did indeed reappear — and with quite a red fury — in May 1968 in France and in the Italian Hot Autumn of 1969. Then there were the South Vietnamese revolution, the Portuguese revolution, the Iranian revolution, the Nicaraguan revolution and the beginning of the Polish revolution (not in a capitalist country, but anti-bureaucratic political revolution is part and parcel of world revolution today). There cannot be the slightest doubt that we should add, as did the German poet Lenau in the middle of the nineteenth century, to a similar list: 'und so weiter' (and so on)! As the history of our century has proven since the beginning of the debate between 'reformists' (or gradualists) and 'revolutionists' inside the socialist movement - since the inception of Bernsteinian revisionism - the real issue is not whether revolutions are 'advisable' or 'bad' ('the embodiment of "evil" and moral sin' as the German SPD chief Friedrich Ebert thought). The real issue is whether they inevitably occur again and again, because the contradictions of bourgeois society - economic, social, political, military, cultural, even moral ones - periodically sharpen. Bernstein, who was much more intelligent and consistent than his latter-day followers, understood and expressed this extremely well. His gradualist proposals hinged upon the probability of a gradual softening of all inner contradictions of bourgeois society on a long-term basis: no more wars; no more sharp economic crises; no more massive unemployment; no more poverty; no more imperialism; no more dictatorships; no more attacks against democratic freedoms; no more massive eruptions of spontaneous extraparliamentary mass struggles. If you draw up a balance-sheet for the twentieth century, you can easily see who was right and who was wrong, Bernstein or Rosa Luxemburg. 1914, 1917, 1918, 1929, 1933, 1936 (Spain), 1939, 1944-‘48, 1956, 1965 (Indonesia), 1968, 1973 (Chile), 1976 (Argentina), 1973-199? (second slump) all speak for themselves. The gradualist thought these catastrophes could be avoided. They have occurred nevertheless. Other catastrophes will occur again and again in the future. Faced with the real movement of emancipation of the real masses of the toilers; faced with these regularly recurring revolutionary crises, it is the sceptics and gradualists of the Elster type and not the Marxists who appear to be Utopians. They, and not we, have recourse at one and the same time to wishful thinking, to impotent exhortations and to the pernicious bias of compromise. I say 'pernicious bias of compromise' because when you try to prevent the workers from taking power (i.e., from pushing the revolutionary crisis to its victory), you divide, demoralize and thereby weaken the working class, and you cause defeats (be it only partial ones, as in Germany/Austria 1919 and in Portugal 1975). You thereby inevitably shift the relationship of forces in favour of the capitalist class. You thus open up a cycle of counter-revolution, of which you yourself can very well end by becoming the main victim, as in Germany. You literally work pour le roi de Prusse. Marx preferred to try to help the workers to achieve victory in the revolutionary processes he witnessed in his time. I believe that that remains the duty of socialists today more than ever, everywhere in the world where such processes actually occur. Even if one – mistakenly - believes that more bad than good comes out of a revolution, to further and to strengthen self-organization and democratic self-activity of the toilers and the oppressed certainly will increase good and reduce bad results. And the victory of counter-revolution is certainly the greater evil. We have never heard or read a convincing counter-argument to this dialectical approach to revolutions in the twentieth century as real (and unavoidable) processes. That's why I remain a revolutionary socialist, in addition to being a socialist (that is, in addition to always being on the side of the emancipatory struggle of all the exploited and all the oppressed). That is Marx's message, both the scientific and the moral-political one. That is what is more than ever alive from his heritage. Marx-bashing is many an academician's favorite occupation today, as the wind of the Zeitgeist blows. The bourgeoisie gives priority to bashing the labour movement and real wages. Both activities nicely complement each other, confirming for the nth time that the ruling ideology of each society is indeed the ideology of the ruling class. Elster is not to be classified among the ignorant and dishonest Marx-bashers; but he has become a Marx-basher nevertheless. He can only prove that 'there is probably not a single tenet of classical Marxism' (xiv) which should not be 'insistently criticized', by distorting Marx's thought, by presenting it as fundamentally incoherent, inconsistent and unrealistic (and therefore unable to explain and to change social/historical reality). He thereby is forced deeper and deeper into the incoherence, inconsistency and unrealism of his own thought. Making Sense of Marx (Cambridge: Cambridge University Press 1985), 4. See my article 'The Role of the Individual in History: The Case of World War Two,' New Left Review 157 (May/June 1986) 61-77. This is a near-farcical throwback to a Rothschild anecdote of the nineteenth century, in which the old rascal is supposed to have silenced a critic by offering him 1/30 millionth of his fortune, as that was supposed to be redistributed among all the inhabitants of France by equal shares. I cannot take up here all the criticisms of Marx's economic theory dispersed throughout Jon Elster's book. Let me mention in passing that the criticism of the solution of the so-called 'transformation problem' advanced by the neo-Richardians, which Elster considers definitive, has in turn been submitted to harsh criticism by 'orthodox' Marxists (see Mandel and A. Freedman, eds., Ricardo, Marx, Sraffa [London: Verso 1985]), to which any reply by neo-Ricardians is still lacking. Organizationally, this passage from the micro-economic to the macro-economic 'motivation' is expressed among other phenomena by the setting up of employer's associations, which by no means consistently acted in favour of increasing wages. Elster also doesn't understand Marx's view that capital can very well be initially accumulated in the circulation process - through appropriation of part of the surplus product produced under non-capitalist relations of production - before it is systematically produced in the capitalist production process itself. The idea that the lords 'exchange' these unpaid labour services for the protection they offer the serfs from potential robbers is of course a joke. It has nothing to do with exchange in the economic sense of the word and is quite similar to the arguments used by gangsters organizing a so-called protection racket – as Elster himself correctly points out. And what about the political disasters 'inspired' by pragmatic moralists a la Max Weber, supporting colonial adventures and imperialist wars, or by 'non-utopian' Realpoliticians of the Kissinger-Nixon type, ordering the bombing and defoliation of Cambodia? Marx to Ferdinand Freiligrath, 23 February 1860. In Marx and Engels, Collected Works, Vol. 41, 57. But carried away by his preference for 'market socialism’, he forgets to pose the relevant question: if by pandering to minority demand for luxury consumer goods (including imported ones) you undermine planned self-management, let market laws rule the distribution of productive forces among various branches of output according to wildly fluctuating 'effective demand,' unequally divided among households, and thereby force millions of producers to work 42 hours a week (instead of 35 or even 30 hours, as they would prefer), then in addition force hundreds of thousands of producers periodically out of work altogether, don't you then do great harm to a great number of people? I believe you do. Does Elster believe the same? I believe that a society of associated producers, who themselves determine what they produce, how they produce it, where they work, and how long they work, by democratic decision-making processes, is a more just society than the one in which 'market forces' decide these things behind the backs of the majority of the producers. Doesn't Elster think the same? I have already answered his argument that a society of plenty as conceived by Marx is a complete Utopia (526) in my article 'In Defence of Socialist Planning' (New Left Review 159 [September-October 1986]). Elster is right to point out the 'risks' of revolutionary victories under materially unfavourable conditions. But what about the dilemma implied in the concomitant risk of counter-revolutionary victories? Trotsky pointed out these dangers as early as 1905-6 and offered a real answer with his theory of permanent revolution: the gradual international spread of revolution, as conditions ripen for it in country after country, both as a result of successive crises in bourgeois society and of the gradual maturing of adequate revolutionary leadership, capable of winning the majority of the toilers for the conquest of power by the proletariat.